Beach n Berry Punch is keiki approved! Grab some Hawaiian Sun drinks for the beach! Check out behind the scenes of our 2019 photoshoot at Kailua Beach, Hawaii. We’re pleased to share with you that you can purchase our popular Passion Orange tropical flavored drink at all Costco locations in Hawaii. Passionfruit and orange flavors are blended to make this exciting, thirst quenching flavor. Need a holiday gift idea? Grab these limited edition Hawaiian Island Creations X Hawaiian Sun surf trunks before they’re sold out at HIC Surf Shops. 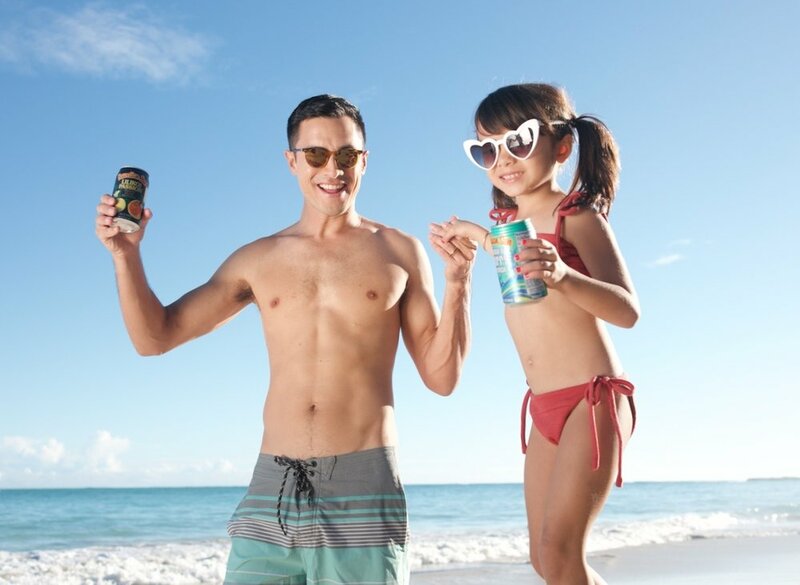 Buy Hawaiian Sun drinks on sale on Oahu for $1.99/six pack at Foodland and 2 six packs for $4.00 at Times Supermarkets this week only. Longs Drugs and CVS has you covered for your Hawaiian Sun fix at their Oahu stores this week only from Oct 21-27. Own a piece of history with our limited edition collaboration boardshorts and tanks with Hawaiian Island Creations. The performance boardshorts feature our popular Hawaiian Sun tropical flavors and jersey tanks feature the year Hawaiian Sun started. Find these items at HIC retail stores in Hawaii and California or online. Collaboration coming soon to HIC stores in Hawaii! Hawaiian Sun drinks pairs great with any Hawaii local food. And yes there is local food in Las Vegas! Hawaiian Sun drinks made a cameo appearance on Magnum P.I. season premiere episode last night on CBS. Hawaiian Sun was mentioned in this video that I saw on a recent flight on Hawaiian Airlines. We debuted our newest flavor, Lilikoi Lychee, at the Made In Hawaii Festival over the weekend and sold out of this popular tropical drink. 65,000 cans of Lilikoi Lychee were consumed and sold in three days during the festival. Retailers including Foodland, Safeway and Tamura's sold out of the newest flavor from Hawaiian Sun. Don't despair, stores will be restocked soon enough! Thank you to all of our loyal customers for your continued support and for choosing Hawaiian Sun as your local favorite beverage company. Learn more about Lilikoi Lychee in this Living 808 segment. Try our latest edition to the Hawaiian Sun tropical fruit drink line, Lilikoi Lychee, at the Made in Hawaii Festival this weekend 8/17-8/19 at the Blaisdell Center in booth 407-408. Hawaiian Sun Lilikoi Lychee is featured in the Star Advertiser Crave section today. Aren't the Lilikoi Lychee cans so pretty in pink? Lilikoi Lychee in the news! Our newest Hawaiian Sun flavor, Lilikoi Lychee, made the morning news. You can buy it in stores this week or try our new tropical flavor at the Made In Hawaii Festival this weekend. We're pleased to announce our newest addition to the Hawaiian Sun family of tropical flavored drinks, Lilikoi Lychee. Try it at the Made In Hawaii Festival August 17-19 at booth 407 or buy it at Foodland, Safeway, Walmart or Sams Club starting next week. Read about Lilikoi Lychee in Hawaii News Now. Stop by our booth #407-408 at the Made In Hawaii Festival Aug 17-19 at Blaisdell Center to try our latest Hawaiian Sun drink flavor. We'll have some show specials on our new drink flavor and chocolate candies.